What are the most common IoT device connectivity options in a smart building? You are here: Home / IoT (platform, gateway) / What are the most common IoT device connectivity options in a smart building? The idea of connecting a building to the Internet to manage everything from the security system to the parking garage is no longer a fantasy- and is fast becoming a reality. Most building owners today understand how a robust cellular digital connectivity infrastructure impacts tenant satisfaction, however, the next generation of smart buildings will require a well designed IoT network infrastructure. While building owners have already understood the impact of robust cellular signals have on tenant retention and occupant satisfaction a host of other digital amenities such as digital signage, hosting services, building intranets, digital conference rooms, state-of-the-art video conferencing services and presentation equipment are increasing in demand. According to most experts, the next generation of high-tech buildings will combine six fundamental technologies – powerful computing, advanced broadband, wireless communications, a standard network, internet appliances, and integrated information systems. However, to effectively deploy these technological improvements an efficient means of connecting IoT devices and sensors across various smart building systems which enable them to communicate effectively with one another and the cloud is necessary. Today the plethora of IoT devices and sensors available at low costs coupled with cloud computing are providing an opportunity for building owners to improve operating efficiencies and asset increase value by adopting an IoT connectivity network. With the future value of assets hinging on wireless management and systems diagnostics understanding best options for IoT network connectivity which enables building owners to monitor, integrate and lower costs has become paramount. There are several connectivity options which can be used to link IoT devices to one another and the cloud such as LTE and LoRAWAN, which are cellular-based, and Wi-Fi-based options. These solutions offer different benefits based on the application or use case. However, the biggest difference between cellular and Wi-Fi-based networking options in smart buildings is that cellular-based networks can work across a much larger range and data speeds. Cellular-based applications like LoRAWAN can operate over long ranges and enable the smart building to connect to smart meters while Zigbee is capable of transmitting data at a faster speed. Cellular-based technologies which deploy Low power wide area networks (LPWAN) are expected to be key growth drivers in smart building IoT connectivity coming years, with NB-IoT, LoRa and Sigfox as the most popular in terms of end-user adoption and ecosystem support, according to a report by IoT analytics. These technologies provide low-power, low data-rate communication over long distances or from deep indoor environments, enabling battery-operated devices to operate for up to 10 years without any human intervention. With the long-range characteristic, LPWAN technologies fulfill key IoT requirements such as bi-directional communication – the ability to both send and receive data from the cloud, end-to-end security, mobility, and localization services regardless of regional or global networks. According to the LoRa Alliance, the number of end-devices connected to LoRaWAN-based networks is increasing rapidly in the Asia-Pacific region and Europe which saw 30% and 50% growth respectively year-over-year in 2018. Despite the growth of the LoRaWAN networks globally, experts say that LPWAN devices have little difference in their use and applications compared with LTE, which is already a focus in U.S. markets. 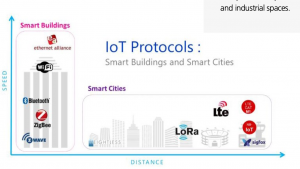 Wi-Fi-based smart building IoT connectivity options . 6LoWPAN combines the latest version of the Internet Protocol (IPv6) and Low-power Wireless Personal Area Networks (LoWPAN) which allows for tiny devices with limited processing ability to transmit information wirelessly using an internet protocol. Its most common applications include monitoring residential smart meters, lighting fixtures and thermostats. The technology was specifically designed because engineers felt that small devices were being left out the IoT ecosystems. However, like most networking technologies, 6LoWPAN has recently felt some serious competition from ZigBee. ZigBee, is a WiFi-based networking technology which is also is designed for low data-rate and battery-powered applications. ZigBee is becoming a more popular, low-cost, low-power wireless mesh networking standard on the market and also the more mature technology of the two. It is typically implemented for personal or home-area networks, or in a wireless mesh for networks that operate over longer ranges. It’s important to note that it is unlikely that an entire IoT infrastructure will deploy just one kind of networking system, a well designed IoT network will often incorporate both cellular and WiFi-based systems. When deploying an IoT networking strategy building owners should consider the short-term and long-term costs and benefits of each option and its reach within the IoT ecosystem to determine which fits best with their smart building goals.